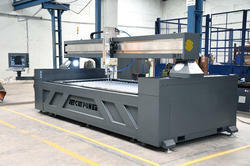 Manufacturer, exporter and supplier of CNC Water Jet Cutting Machines. 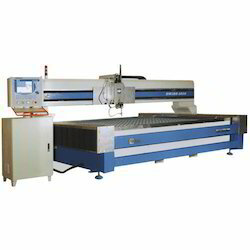 Our organization is involved in manufacturing and exporting wide range of CNC Water Jet Cutting Machine - KMT Series that are available in various industrial standards. Waterjet cutting by CNC Waterjet Cutting Machine is a relative and the most creative innovation that is equipped for cutting assortment of mechanical materials. It includes a high stream of exceedingly pressurized water that can slice any material from pottery to titanium. This apparatus is astounding with regards to cutting certain materials which are generally hard to cut with instruments like lasers or edges. Since, these devices don't create any sort of dangerous waste; they are thought to be ecological benevolent gadgets. They give a decent workplace to a client and its industry. 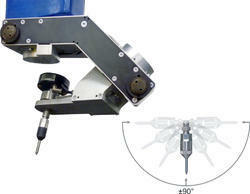 Waterjets are normally executed in the assembling part to shape an extensive variety of assembling materials. In this way, when utilized legitimately, they turn out to be a fantastic expansion to the general assembling process. Product introduction:water jet machine uses cold supersonic erosion to provide through cut in almost any materials both metals and nonmetals. The highly pressurized water stream is forced through a tiny area which carries abrasive garnet to erode away the material. In addition we are also dealing in products like waterjet cutting machine, cnc waterjet cutting machine, abrasive waterjet cutting machine, cnc abrasive waterjet cutting machine, waterjet cutting machines, water jet cutting system, abrasive cnc waterjet cutting machines, water jet cutting machines, abrasive water jet cuttings, abrasive cnc waterjet cutting machine, waterjet machines, water jet cutting machinery, waterjet machining, water jet cutting services, water jet cuttings, waterjet technology, profile cutting machine, glass cutting machine, metal cutting machine, stone cutting machine, ceramic cutting machine, cutting machine for job shop. We are the leading manufacturer and supplier of Waterjet Cutting Machinerymade from high quality material. Discussing the working of Waterjet cutting machinery, the cutter is attached to a high-weight water pump. It is through the spout, a surge of water is catapulted at high speed empowering the apparatus to cut the materials easily. The apparatuses like these machineries use almost a large portion of a gallon of water for every moment, which can be later, reused with the assistance of shut circle framework. Some different applications incorporate gasket and creation, aeronautic trade, and car segments as well. This thusly demonstrates that this hardware has high capability of working even in those businesses that expect requesting final products. We are the leading manufacturer and supplier of Abrasive Waterjet Cutting Machine made from high quality material. Just a direct measure of vitality is required to work an Abrasive waterjet cutting machine. Henceforth, this device turns out to be exceedingly vitality productive as well. After utilizing waterjet cutting innovation, one can encounter the most elevated degrees of exactness and speed during the time spent assembling. These instruments are ordinarily utilized as a part of different machine looks for mind boggling cutting of materials like stone, elastic, plastic, cover or wood. At times, the waterjet is just joined with other rough materials for getting a cleaner cut for particular applications in various businesses. They are additionally utilized as a part of mining businesses and in assembling parts for apparatus. We are the leading manufacturer and supplier of CNC Waterjet Cutting System made from high quality material. Generally, the powerful water utilized as a part of auto washes "cuts" earth from your vehicle. Yet, with a CNC Waterjet Cutting system, the power is around 30 times that of the washer wand used at your local auto wash. Actually, the water weight is normally near 20,000 and 55,000 pounds for each square inch (PSI). Waterjets can cut in light of the fact that the shower is directed through an exceptionally limit jeweled spout at a high strain to keep the splash centered. There are two sorts of waterjets: unadulterated waterjets and rough waterjets. The unadulterated waterjet is the first water cutting strategy. We are the leading manufacturer and supplier of Double Cutting Heads Waterjet Cutting Machinemade from high quality material. We are the leading manufacturer and supplier of 5 Axis Waterjet Cutting Machine made from high quality material. Waterjet cutting has been around since the 1950s. It was first utilized by Dr. Norman Franz, a ranger service build searching for a superior approach to cut wood from huge trees. From that point forward, it has enhanced massively, and turned out to be a very viable strategy for cutting almost any level material, including stainless steel and aluminum. A 5 Axis Waterjet Cutting Machine utilizes a high weight stream of water to cut or clean materials. The cutter is regularly associated with a high-weight water pump with the water being shot out from the spout, which at that point slices through the material with rapid water. There might be added substances as abrasives that assist with the procedure. We are the leading manufacturer and supplier of Gantry Type Waterjet Cutting Machinemade from high quality material. 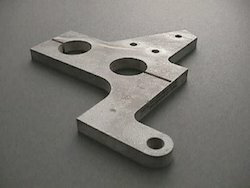 Today, numerous ventures have consolidated the utilization of waterjet cutting innovation in their cutting operations. A large portion of the modern cutting operations in the avionic business like forming, cutting and reaming of air parts are currently simpler by the utilization of these high-weight planes. 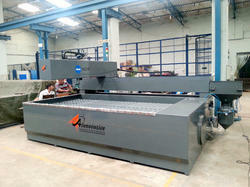 A Gantry Type Waterjet Cutting Machine is dustless. It does not create lethal gasses to the environment. It can be ceased or impeded in the middle of the procedure without making harm to the material. It offers more prominent cutting pace. It gives more prominent cutting exactness. It offers more prominent generation adaptability. Likewise, the device assumes a vital part in the mining business too. The present mining organizations make utilization of waterjet in penetrating and cutting rocks in hard-shake mines. We are the leading manufacturer and supplier of Waterjet Cutting Machine made from high quality material. 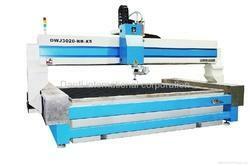 We offer Water Jet Cutting Machine in the model specification Flying Arm CNC Cutting Table. Durable and easy to operate, these are fabricated as per international standards. The machine make use of high pressure water for cutting soft as well as hard materials like rubber, foam, steel, glass and many more. Heavy frame construction for better accuracy, high pressure pump and separate stainless steel tank are the few advantages associated with the machine. Our range is also customized as required by the client. The maximum quantity of orifices installed can be increase or larger orifice sizes can be installed by reducing the working pressure. Please feel free to contact us for your individual calculation. A series of high-pressure lines, pumps and intensifiers force a stream of filtered water through a tiny orifice in a jewel. The stream, which is pressurized up to 60,000 psi, mixes with fine abrasive garnet in a tube to provide extraordinary cutting power. Motion-controlled machines transport the jet nozzles along programmed paths to cut complex profiles. Water jet machine can cut range of materials : acrylic, alloys, aluminum, brass, carpet, ceramic, composites, copper, corian, felt, foam, fiberglass, formica, gaskets, glass, granite, inconel, insulation, laminates, leather, marble, plastics, quartz, rubber, silicone, stainless steel, steel, stone, titanium, wood, etc. Water jet machine uses cold supersonic abrasive erosion to cut almost any materials both metals and nonmetals. The highly pressurized water stream is forced through a tiny area which carries abrasive garnet to erode away the material. This machine can be used for following applications and industries: ceramics, stones, glass, metal artwork, metal cutting, exotic & non traditional materials, automotive, aerospace, electronics, job & machine shop applications, etc. There are many focal points that have made this mechanical cutting apparatus an option for some conventional cutting advances. It can be worked on any part of the material that you have. Multi Cutting Head Waterjet Cutting Machine is totally isothermal. It is perfect to cut materials, for example, glass, wood, marble, metals, and plastic and food items. It has brought down the set up cost.There is no compelling reason to change the set up according to the materials to be cut. It lessens the measure of the rubbing materials left after the operation. All you need to do is to maintain a strategic distance from the need of any optional completing operation. Manufacturer, exporter and supplier of Water Cutter Machine. CNC Waterjet Cutting is an industrial tool capable of cutting a wide variety of materials using a very high-pressure jet of water, or a mixture of water and an abrasive substance. The term abrasivejet refers specifically to the use of a mixture of water and abrasive to cut hard materials such as metal or granite, while the terms pure waterjet and water-only cutting refer to waterjet cutting without the use of added abrasives, often used for softer materials such as food or rubber. This technology does not require a lot of heat and so it does not transfer over to the material, which can alter the properties of a material. 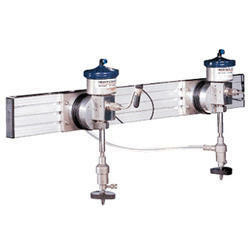 It is used for processing of almost all materials to give a precise product. It is eco-friendly as there is little to no waste of water and does not produce any poisonous gas. Less material is wasted due to narrow bridges and ribs, which gives precise cutting. There is no tool manufacturing or storing cost. It is quick to install and requires less maintenance. This machine is linked with the CAD/CAM programming system. 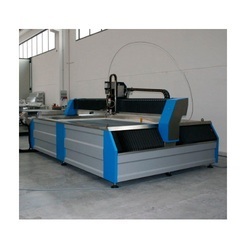 Aluminium water jet cutting machine is used to cut metals. Our aluminum water jet cutting machine uses cold supersonic erosion to provide a smooth cut. With our rich industrial experience, we had emerged as a reliable and well-reputed company in offering quality water jet cutting machine. The machine uses high pressure to cut a wide variety of materials. Our professionals are experts in manufacturing water jet cutting machine. Our experts use optimum quality material and latest technology to provide great quality water jet cutting machine. Our experts manufacture machines with great care to set norms of the industry. You can buy these quality machines from here at any time at an affordable price. 5 axis CNC waterjet machine is used to cut a variety of metals especially designed when there is a need for an extreme precision cut. This allows you to cut a 3 D object from 0 to 90 degree. 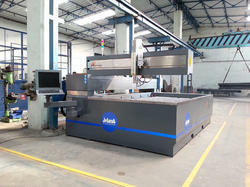 While a few years ago, abrasive and pure water cutting looks like just an imagination but this becomes a reality now.This machine opened up lots of applications which can be done with the help of water jet. Our experts work as an international standard. All our machines are presented by us with a modified version as per the need and the demand of our clients. 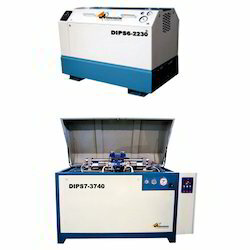 If you are looking for power pressure or cutting machines then it is time to contact us right now. 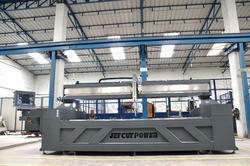 Looking for Waterjet Cutting Machine ?